Putnam, CT, God and Tom Deary, in close collaboration at his home in Putnam, decided early in the afternoon on Saturday that Tom was being called home to heaven. Tom, a beloved husband, father, grand-father, and great grand-father, passed away at home with his family by his side, supporting his safe and comfortable passage into heaven. 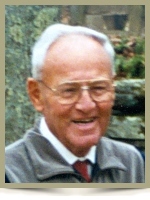 “Grampa” as he was commonly referred to by his many grand and great grand-kids, considered service to others, along with humility and respect, to be necessary components of a good and decent person. Tom was born in 1925 in Worcester, MA to Thomas and Elizabeth (Kelly) Deary. He was raised in Dudley, MA, attending school at St. Louis and Bartlett. Tom proudly served his country in WWII in the United States Navy, aboard the Normandy 25, from where he was honorably discharged in April of 1946. Tom joined the family business- Deary Bros Dairy Co. Following his lifelong philosophy of “I would never ask anyone to do something I am not willing to do myself” and “You’ll get out of it what you put into it” Tom established himself as a hard-working, respected businessman, who with his family built, operated and managed a number of successful businesses, including Deary Bros Milk Inc, Deary Bros Restaurants and Sunnyside Farms Convenience Stores. He served as Chairman of Putnam’s Board of Finance for many years. Tom also served as Honorary Chairman of the Deary Memorial Road Race for all of its 18 years. Offer Condolence for the family of Thomas Charles Deary Jr.